I’m all about the chickpea in my everyday life, which is kind of funny because I don’t have a lot (follow the link at the bottom of the page for more) of chickpea recipes on my site. I’m usually just tossing them in salads and sometimes leftover soups, just to work a few servings in every week. Most of those little additions just don’t seem “blog worthy” but my Southwestern Smashed Chickpea Avocado Sandwich definitely is! What sets this sandwich above and beyond the rest of the ones I’ve tried is those Southwestern flavors. Chickpeas, healthy as they are, can be a bit dull. And while I love avocado, it’s smooth and creamy and doesn’t add as much to the party, flavor-wise, as you might think. But spice those simple ingredients up and it’s a whole different story – all of a sudden you’re going from ho-hum to crave-worthy. If you’re going low-carb, you absolutely don’t have to make your Southwestern Smashed Chickpea Avocado Sandwich into a sandwich. It’s going to be fantastic in a lettuce wrap and a great candidate for wrapping in collard greens – the flavors would be fantastic and strong enough to stand up to the collard’s own bite. And if you’re of the healthier bent, a good whole grain bread will be great, too. Or, you could just eat it from the bowl, or serve it on little toasts or crackers for a munchy appetizer. The great thing about Southwestern Smashed Chickpea Avocado Sandwich is how good both Avocado and Chickpeas are for you. According to the World’s Healthiest Foods, as little as 1/3 of a cup of Chickpeas eaten daily, in addition to all their other health benefits, can help regulate blood sugar and insulin. As far as the Avocado, you’ll want to make sure to get all the avocado that’s closest to the skin, and if you think you know all the health benefits of avocado, you might be surprised when you see what the World’s Healthiest Foods has to say about them. Making Southwestern Smashed Chickpea Avocado Sandwich is so super easy. Just smash up your chickpeas to the consistency you want and mix everything up. The chickpeas can be amazingly indifferent to attempts at smashing, though. I found a big serving fork worked best and it was easiest to smash them in a small, flat-bottomed casserole. I hate to dirty up an extra dish but smashing them in a bowl just was a lesson in frustration for me! I suppose if you’re really determined to have fine little chunks of chickpea, you could pulse them in food processor, but I like the variation of some smashed and some whole. Feel free to tinker with the spicing and jalapeno amounts in this recipe to suit your taste. It’s not hot, by any means – I just used a smidge of jalapeno and a bit of cayenne, but up that heat, if you’d like. I used garlic powder specifically because I can’t finish this recipe in one sitting, and fresh garlic can get quite a bit stronger in the mix if it’s stored in the fridge. About a clove works, too, minced very finely. While any chickpea works in this recipe and canned are just so super easy (and I always have a few cans around) I love using my chickpeas braised in herbs and bay. It’s kind of amazing how good chickpeas are when they’re treated lovingly and given just a bit of attention and those gorgeous, flavorful chickpeas bring a whole new dimension to the Southwestern Smashed Chickpea Avocado Sandwich. It’s cheaper to cook your own chickpeas from scratch, too, but more on that, below. Here’s the recipe for Chickpeas with Bay Leaves & Herbs if you’d like to take a gander at it. Avocados can be pricey little devils but finding a few strategies in buying can help lower the cost. First of all, look for them on sale, and buy them at various stages of ripeness. Get a couple close to being ripe fr the current week, then several kind of ripe and some hard. Then you’ll have sales prices avocados for a week or two. Once they’re soft and ripe (they yield when pressed very gently) put them in the fridge. If you need avocados to ripen faster, store in a bag with a banana. Microwaving or baking them does soften very had avocados, but doesn’t ripen them, btw. I’ve spoken all about the cost of chickpeas and did a pretty good comparison over the price of various cans compared to the equivalent amount of dried and cooked at home chickpeas in my post on Make Your Own Hummus & Vegetarian Wraps. The bottom line? While making your own Chickpeas can be a savings, buying them usually won’t break the bank. Generally, for most beans, expect the cost of canned to be about 3 times the amount of making your own, when the equivalent amounts are compared. I like to cook my chickpeas up and bag them in 1 1/2 cup portions, then freeze them so they’re at the ready. As I said at the bottom of the post, While the numbers look dramatic (oh my, three times the amount) if you were to eat a can’s worth of chickpeas once a week, you’d be paying about 67 dollars a year if you bought your chickpeas at $1.29 a can, and $18 dollars if you bought them at the $1.49 a bag price. Canned or dried, chickpeas are a great food value! Place chickpeas in a bowl and with a large fork, smash them to desired consistency; be patient and smash as many or as few as you’d like. Add the remaining ingredients and stir in. Assemble sandwiches with your choice of bread & garnishes. I’ll be sharing my Southwestern Smashed Chickpea Avocado Sandwich at Fiesta Friday #243, hosted this week by Catherine @ Kunstkitchen’s Blog and Becky @ Bubbly Bee. This entry was posted in Click here for Fabulous Food Posts and tagged Avocado, Bread, Chickpeas, Green Onion, Hot Peppers, Jalapeno, Lime, Mexican or Southwestern, Sandwiches. Bookmark the permalink. Mollie, how long do you think this would keep in the fridge? The lime juice should stop the avocado from browning, but do you think you could make it a day or two ahead? I made mine in the evening, had some for lunch the next day and finished it off the following day for lunch and it seemed fine. I was a bit worried but was pleasantly surprised how well it lasted! 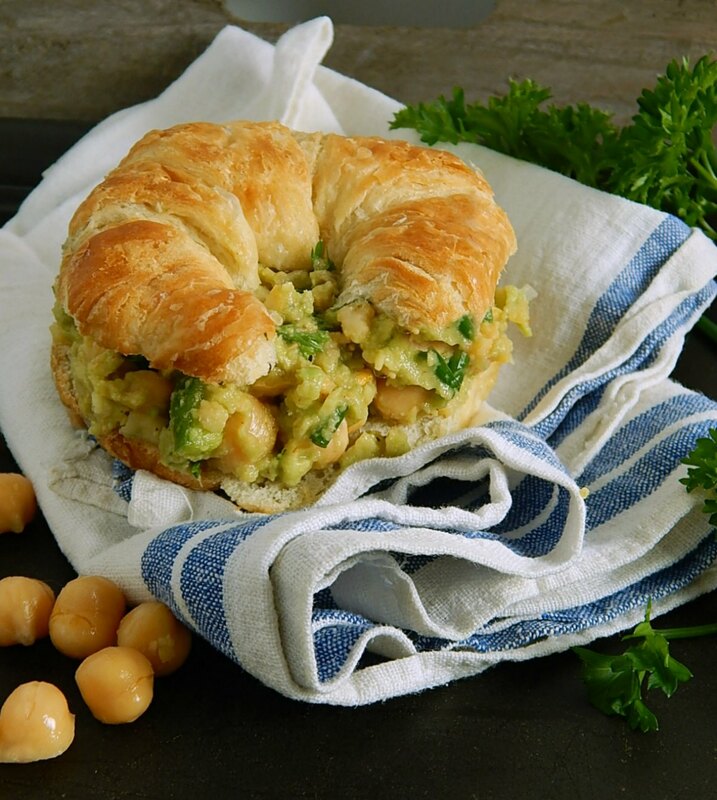 What a pairing Mollie – smashed chickpea and avo….I can’t believe I haven’t heard of this before now! I kind of thought it might be a little “old hat” so I’m glad I posted it!! Mollie, why didn’t I think of this? Perfect idea, as I mash avocados with goat cheese to spread on my morning toast. I’ll be mashing this one up as I love kikärtor (chickpeas) and avocados. Maybe I’ll put some goat cheese in as well. Hi Ron, I think that a little goat cheese would be amazing in these sandwiches, so I’m having a “why didn’t I think of that” moment! A little tang to freshen it up a bit! Fabulous! And I love that you put the flavorful mixture on croissants. Perfection. Thanks Mimi! I just found out my son’s girlfriend has never had a real bakery croissant so it is our new mission to find the best one in the twin cities! 🙂 Acctually now that I think about it there are probably quite a ffew people that haven’t had one. Have you ever had Williams-Sonoma croissants? I got them as a gift and they’re magnificent. Especially for not being in France. But they’re nice to have around the holidays in the freezer. No I have not! But now I think that might be the perfect little thing to send to my folks for Christmas! I have been trying to send them little food gifts that are things they miss now that they are in assisted living! Thanks, Mimi! And maybe I’ll send a package to me, too! Their chocolate croissant are wonderful also. This would be great as a dip as well. So many options with this fabulous recipe! Yes, it would! With pita or tortillas. Thanks, Virginia. Hi Claire, I just found your note in the junk file! Thanks! Avocados make even chickpeas taste wonderful! This looks great! I love avocado. Another great way to eat it! Thank you for sharing. YUM! It’s my pleasure! Thanks you! Great combination and one of my favourites for a sandwich, wrap or even on toast. Chickpeas are one of the very few foods I can take or leave, though I love a good hummus. I agree that they can be a pain to mash, and when I make hummus, I generally use my mini food chopper to mush them up. This actually looks VERY yummy, and I would probably add some minced chicken to the mix, but otherwise, definitely an excellent lunch! Thanks! If you’re a little lukewarm about them, you might try the braised chickpeas I linked to – it’s a game changer! Or maybe you’d want to skip the chickpeas and just go chicken and avocade – that;s a match made in heaven! I’ll have to give the braised chickpeas a try. That’s not something I would normally think to try but I’m intrigued now. I have tried them with dried herbs and it is not nearly as good as with fresh. It’s hard to believe that it would make such a difference, but it does. Yum! Love this idea and LOVE that blue plate! Somehow I missed your comment~ Thanks!! I love that plate, too!